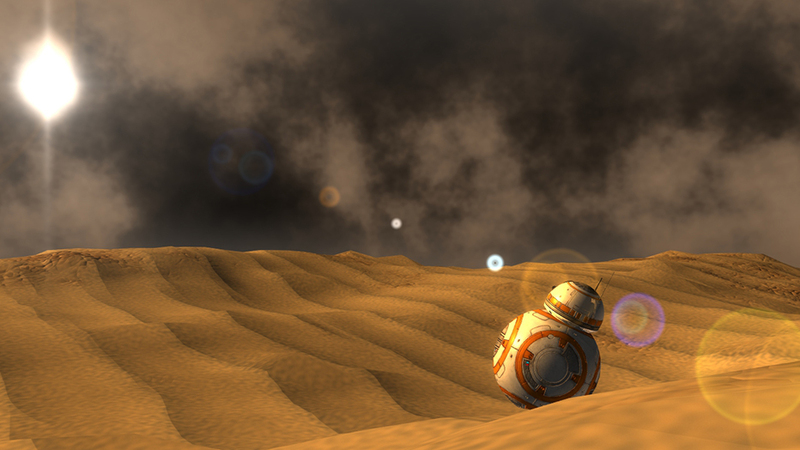 Following on the Star Wars fan tributes, the artist Champ Lein (AKA LookingMercury3D) shows his love to the most famous droid from Star Wars Episode VII. 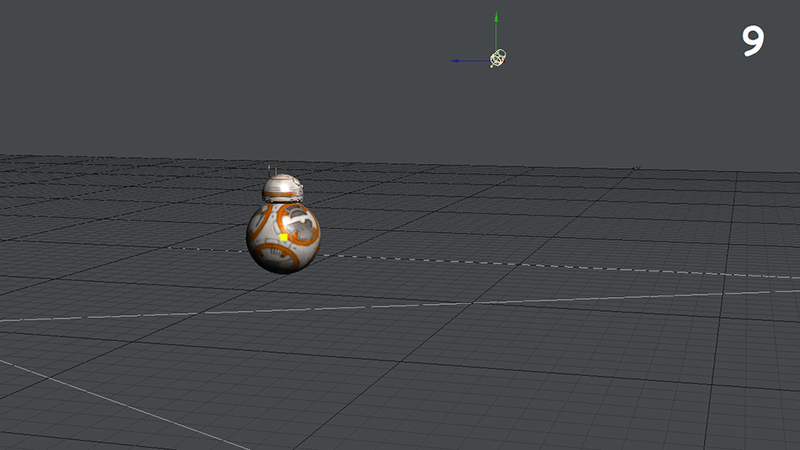 Captivated by BB-8’s unique spherical design, he reproduces this unique little duo-spherical robot movement using LightWave. 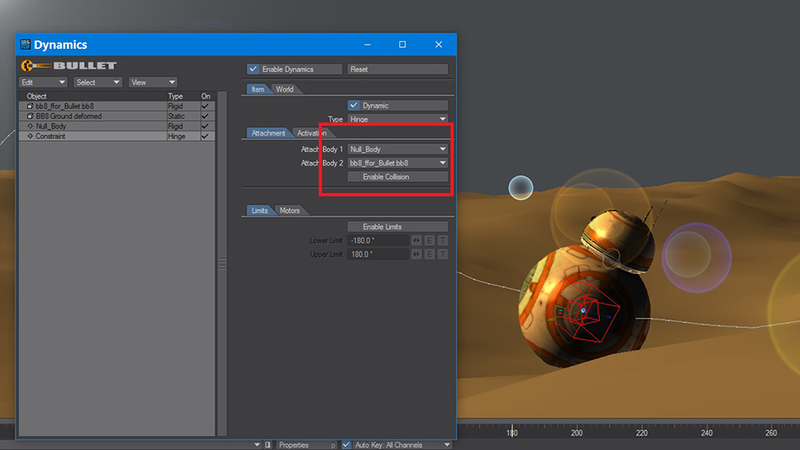 From modeling to animation, he will show you how to setup and animate the little duo-spherical droid using LightWave 3D! 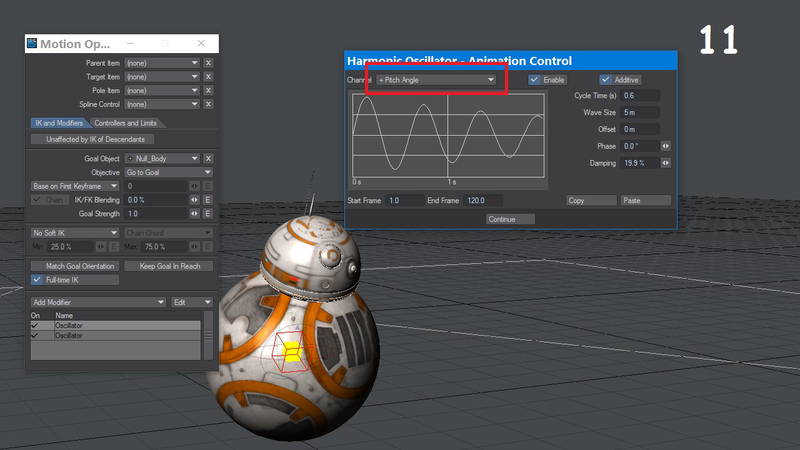 The thing that called my attention when I first saw the new Star Wars BB-8 droid was this new way of movements, that can roll and balance all by itself. 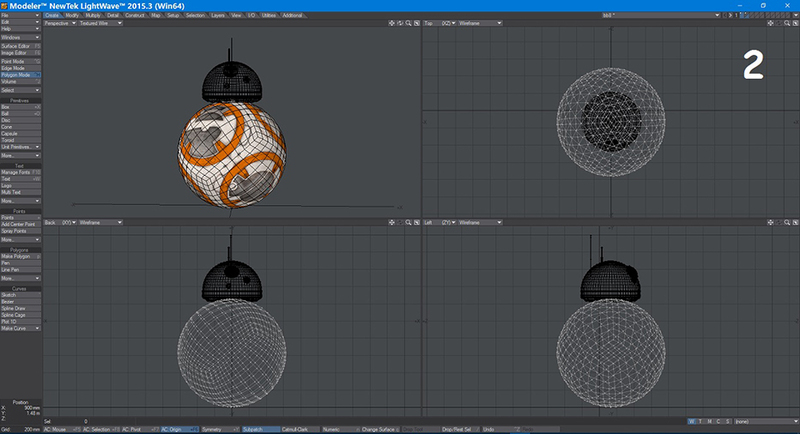 I was captivated by BB-8’s unique spherical design, and that neat floating head that magically never falls off. 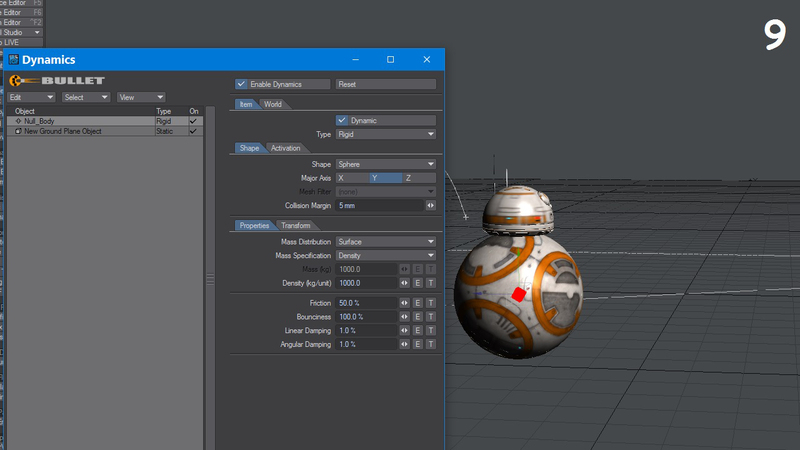 I was also surprised and completely amazed to see a fully-functional BB-8 built in real life. This is what makes me wanted to reproduce this unique little duo-spherical robot movement using LightWave. I had first to create on a very simple rig that has to work with Bullet dynamics in order to produce realistic movements. 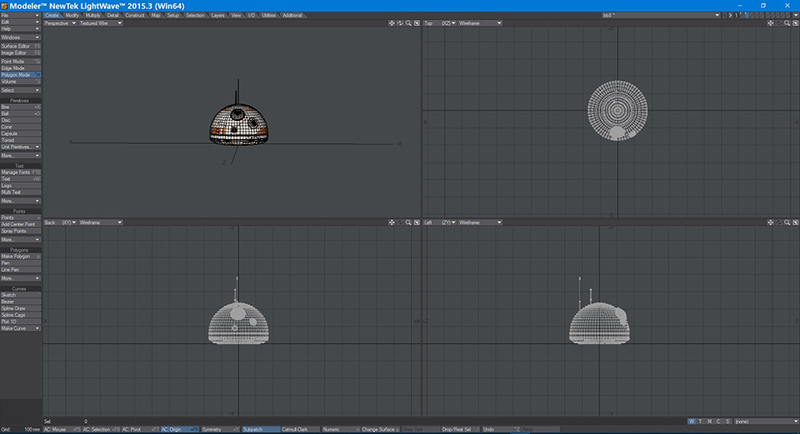 I'm sharing with you all the different steps I've been following to recreate this BB-8 3D animation. Enjoy! 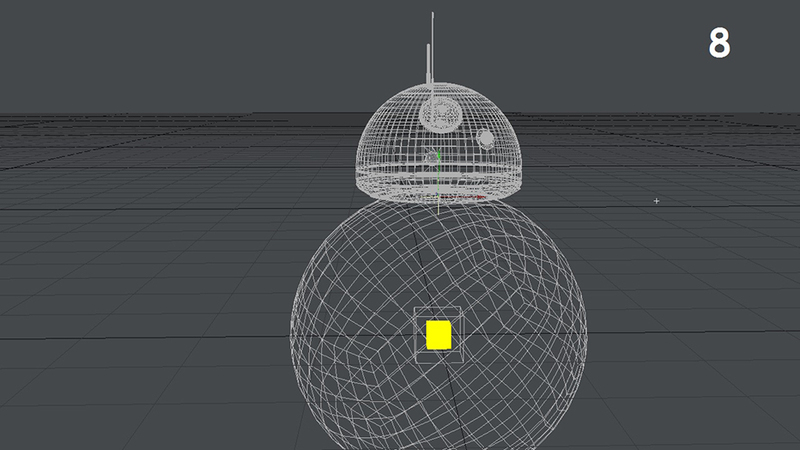 The original BB-8 3D model was a one-layer object so I had to separate the body and head in 2 different layers first. and F3 to place the head (Layer 2) on the Hemisphere Center. This is how it should look after saving and exporting in LightWave Layout. Leaving the two layers on their initial position, create three NULLS: NULL_Body, NULL_IK and NULL_Head. Parent the body (Layer 1) to NULL_Body since this NULL will be the Master. After selecting the NULL_IK and opening motion Options, set as "Goal Object" the NULL_Body. 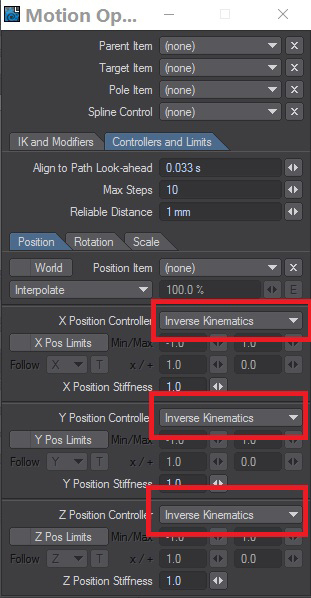 Go to Controllers and limits label, in position XYZ set all as Inverse Kinematics. Select first the NULL_Head and parented it to NULL_IK. Select the head (Layer 2), parent it to NULL_Head and select the NULL_Head to move it in +Y position until you get a correct position of the head. Select the NULL_Body and move it above the Ground. Since Null_Body is the master, all objects must move together. At this point, you can turn and move the NULL_Body for testing. Make sure the head follows the movement of the NULL_Body and stay static at the top when it rotates. 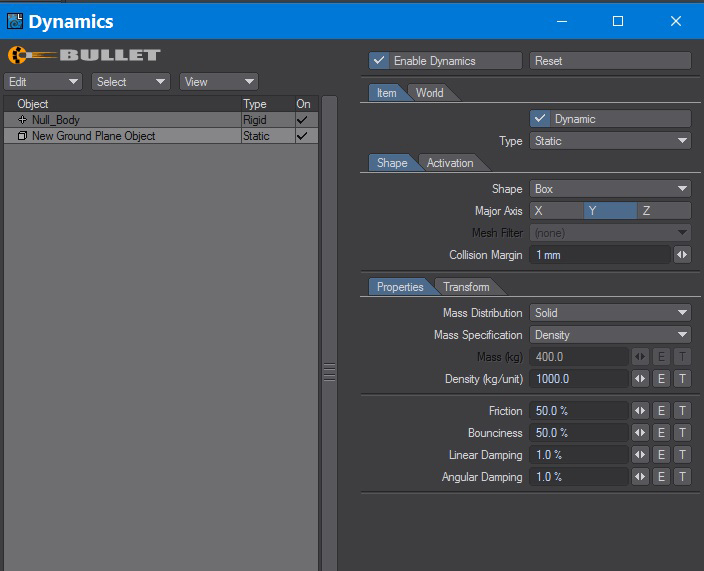 Now that the rig is complete in a pretty easy and fast way, we are going to use it with Bullet Dynamics to create some cool realistic movements! Select the NULL_Body and move it up to take it off the ground. Go to key frame 10, move it in Z- direction creating a key Frame and then go back to key frame zero. 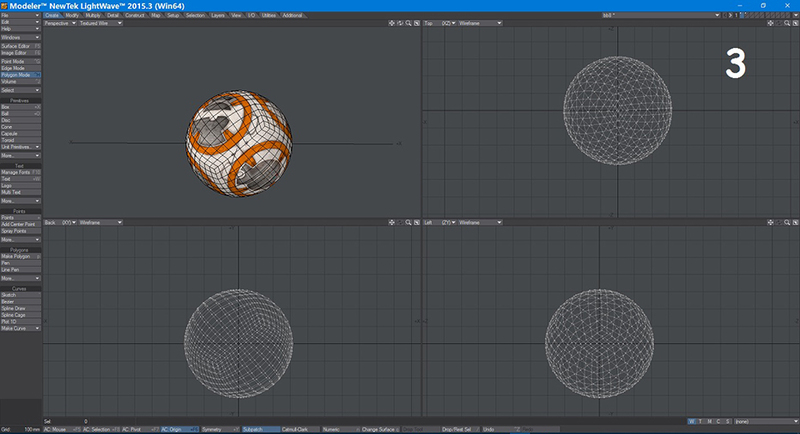 With Null_Body selected, go to LightWave FX tools label and convert it to Rigid Body, open the Item Properties panel and select Sphere in the Shape section. 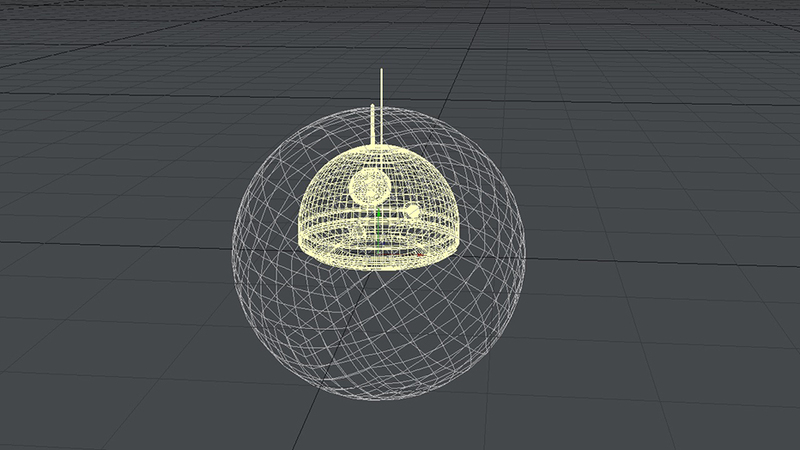 In Transform section, increase the scale until the sphere has the same scale of the body (Layer 1). In Item Properties Shape --> Box, create a Ground Plane and convert it to Static Body. Press Play in the LightWave Time Bar: the simulation starts. As you can see, the body rolls like a ball but the head stays static in his position. We are going to add some movement to the head using a LightWave internal motion Modifier. 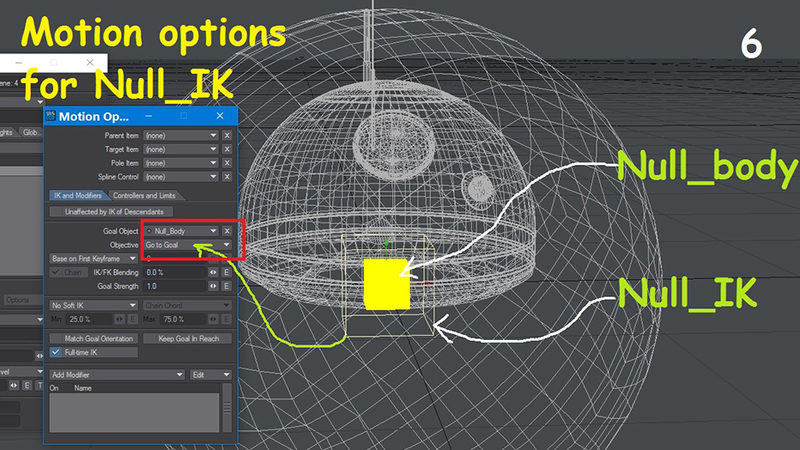 This is optional: Select the NULL_IK, open Motion Options, add Modifier -> Oscillator. Open its properties in "Channel" set Pitch angle, change the general parameters as you like. You can add a second oscillator on the Bank channel. Adding these little oscillations will make the head move in a more realistic way. 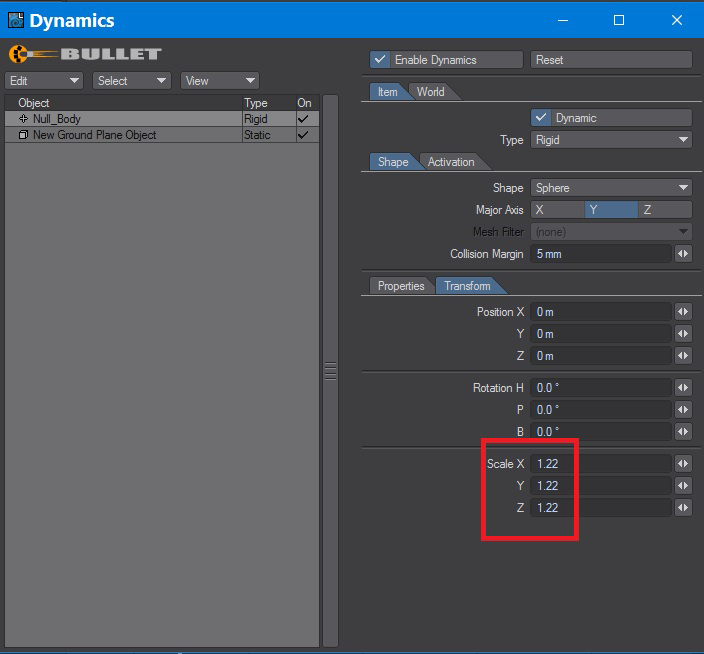 If you want to create manually created Key Frames movements, you only need to manipulate the NULL_IK in rotation channels, it will be added to the automatic oscillations. At this point, I decided to automate more the Scene using Bullet Constraints and Motors Options, as well as adding a Deformed ground plane to see the robot running and jumping. Pretty simple but effective! You can now select the NULL_Body as well as the body (Layer 1) and go to FX Tools and press "HINGE". After that, go to Item Properties and you will see a new Constraint Item. Go to Motor, active it and start to play with values until the robot moves like you want. Later, you can add the deformed Terrain, Static Body type, In properties Shape --> Convex piece. Start the simulation, play with some settings in Bullets and that's all! It works perfectly! 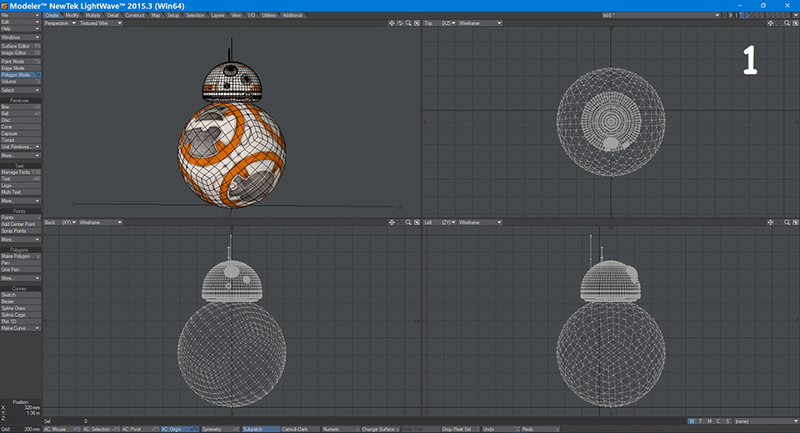 You've created a beautiful BB-8 3D animation with LightWave! Enjoy!